An evening at the remarkable and magical Ponzi Vineyards is not something you’ll soon forget. The stunning winery is nestled in the Chehalem Mountains and enjoys sweeping sunset views. Behind every bottle of Ponzi wine is more than four decades of winemaking discovery and innovation. Founded in 1970 in Oregon’s lush Willamette Valley, Ponzi Vineyards is internationally acclaimed for producing some of the world’s finest Pinot Noir, Pinot Gris, Pinot Blanc, Chardonnay and White Riesling, as well as Arneis and Dolcetto, two rare Italian varietals. With delicious wine in hand, stroll through the vineyard with 360 views of the beautiful Oregon wine country surrounding you. Slowly make your way back to long community tables, with candles and wine glasses shimmering in the late evening sun. Relax into each of the six-seven courses expertly prepared by Field & Vine Event Chefs Pascal Chureau and Ian Ragsdale. 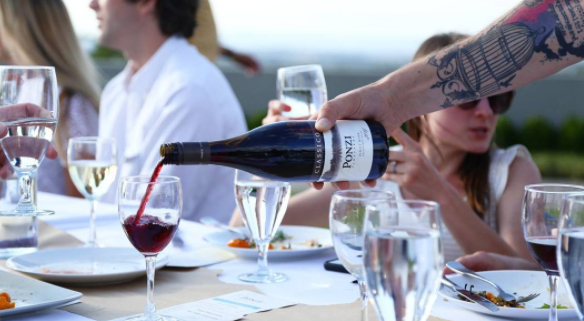 Field & Vine is thrilled to host this dinner at this local treasure and looks forward to crafting an exquisite menu befitting of the Ponzi wines.